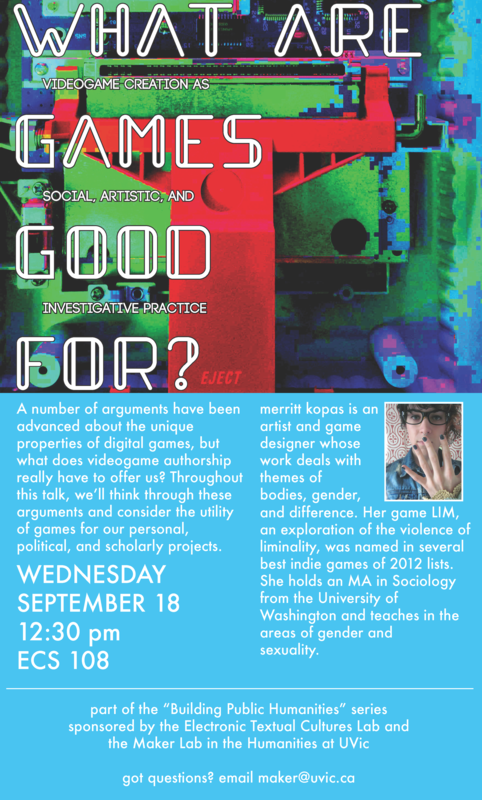 As part of the “Building Public Humanities” project, and with support from the Electronic Textual Cultures Lab, merritt kopas will be visiting the University of Victoria on September 18th to give both a talk and a workshop on videogames and gaming cultures. merritt is an artist and game designer whose work deals with themes of bodies, gender, and difference. Her game LIM, an exploration of the violence of liminality, was named in several best indie games of 2012 lists. She holds an MA in Sociology from the University of Washington and teaches in the areas of gender and sexuality. Event details and posters are below. Merritt’s talk—“What Are Games Good For? Videogame Creation as Social, Artistic, and Investigative Practice”—is open to the public. Please spread the word (poster included) to anyone who might be interested, across disciplines, professions, and affiliations. At the moment, however, the Twine workshop is already full. But we will make an announcement—likely via Twitter—if a seat becomes available. The posters below were designed and made by Jon Johnson, who recently joined the Maker Lab to conduct physical computing research during 2013-14. Thanks, Jon! See you on the 18th at 12:30pm in ECS 108, everyone! We are absolutely thrilled about these two events and want to thank merritt for taking the time to visit us. A number of arguments have been advanced about the unique properties of digital games, but what does videogame authorship really have to offer us? We’ll think through these arguments and consider the utility of games for our personal, political, and scholarly projects. Twine is a hypertext authoring tool that has been taken up as an accessible game authorship platform. 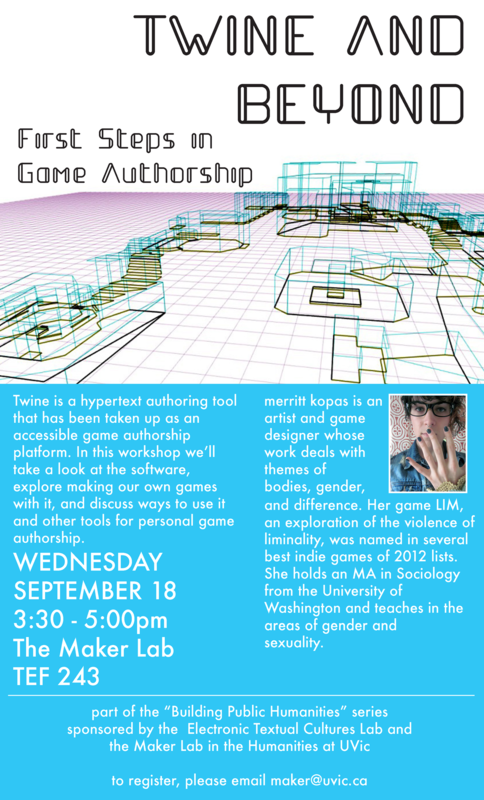 In this workshop we’ll take a look at the software, explore making our own games with it, and discuss ways to use it and other tools for personal game authorship. Post by Jentery Sayers, attached to the BuildingPH and HelloWorld projects, with the news tag. Featured image for this post care of LIM, by merritt kopas. Posters by Jon Johnson.